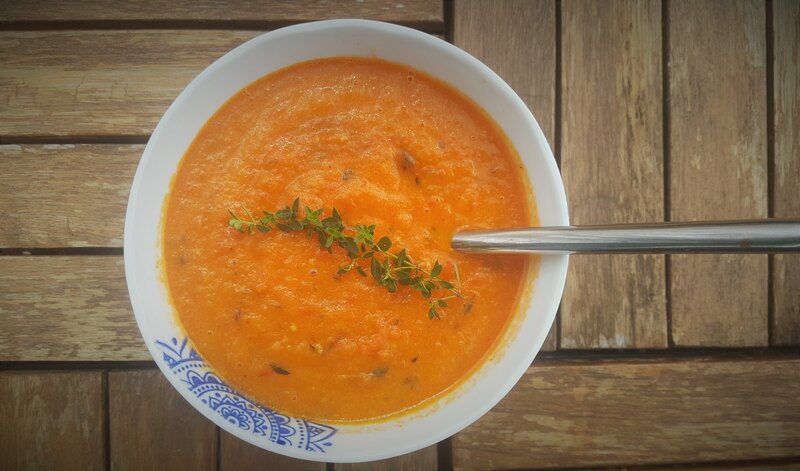 This time I would like to share a great and very delicious recipe for a roasted tomato soup. 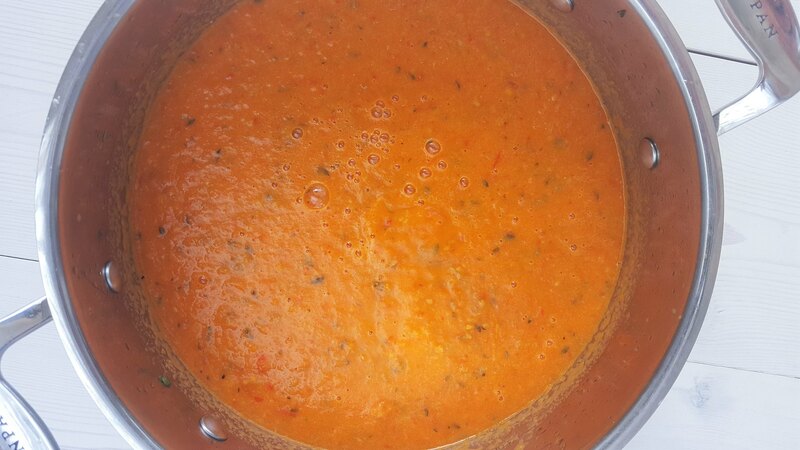 A traditional tomato soup is normally cooked on a stove in a saucepan or similar. This tomato soup is mainly prepared in the oven by roasting some great ingredients. This way the soup gets a super delicious and special taste. This recipe is very simple to prepare. You simply just clean the vegetables, cut them in smaller pieces and roast everything in the oven for about 45 minutes. 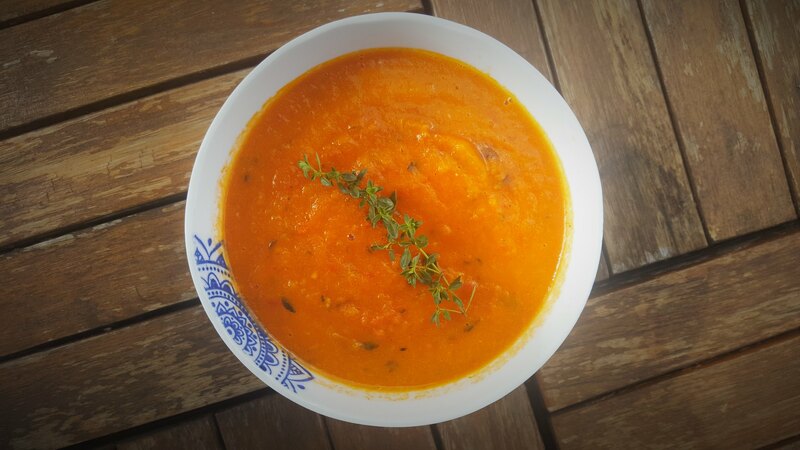 For this soup I have used tomatoes, onions, garlic and fresh thyme as the four main ingredients. However, you can easily add extra ingredients according to your preferences. I can recommend adding a chili, ginger, other herbs, potatoes and so on. It is basically only your imagination that is the limit. 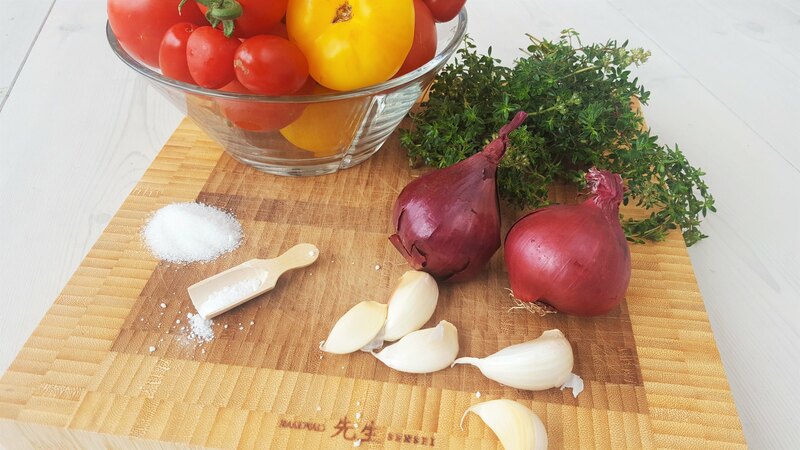 If you can recommend some great ingredients I would love to hear from you in the comments section below. 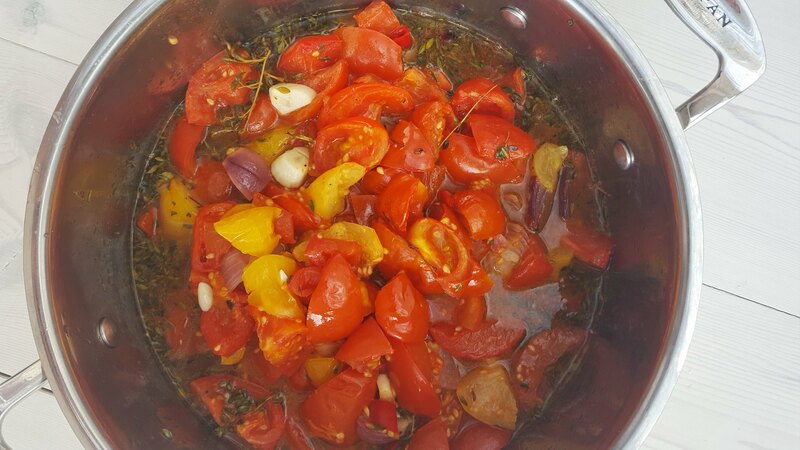 For this recipe I used a mix of different tomatoes from my garden. However, you can also just use the same sort of tomatoes. I will recommend making a nice and large batch of this soup. You can always just freeze some of it down. Then you have a fast and really delicious dinner which only needs to be reheated. I personally always have some homemade soup in my freezer for the lazy days. You should serve this tomato soup together with some freshly baked bread. The oven is turned on anyway so you might as well make some homemade bread. I have several recipes for delicious bread which you can find in the section for bread. However, my favorite is this braided bread. 1. Wash and clean the tomatoes. Cut them in small quarters. 2. Peel the garlic and onions and cut them in smaller pieces. 3. 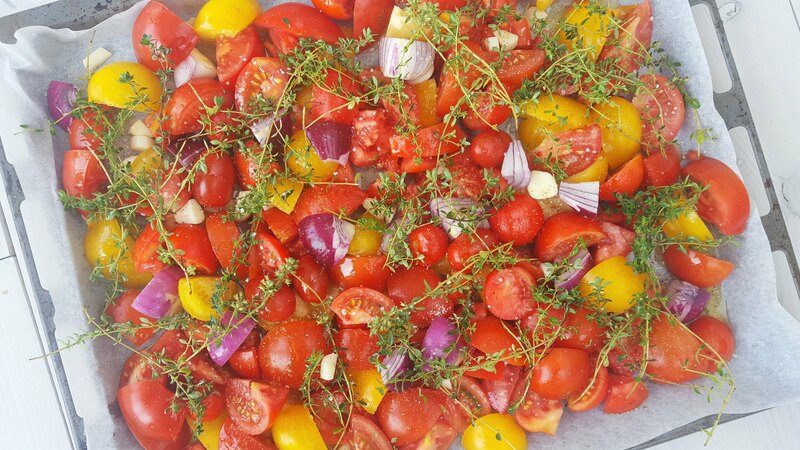 In a large ovenproof dish or plate; add the tomatoes, sugar, olive oil, onions, garlic, thyme, salt and pepper. 4. Bake everything at 200 C (400 F) for 45 minutes. 5. When done; remove the thyme leaves from the stems using to fingers. 6. 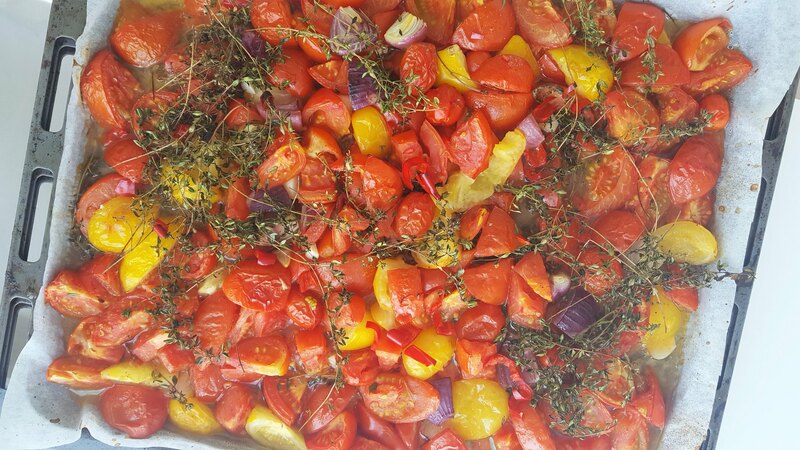 Pour all the roasted tomatoes and other ingredients into a large saucepan and blend everything using a hand blender. You can also use a normal blender if you have one. 7. Finally; heat up the soup in a large saucepan. Add balsamic vinegar, salt and pepper to taste. Tip: Serve the soup together with some freshly baked bread. I made your roasted tomato soup and it was absolutely delicious! Thank you for the recipe! I made homemade bread in my cloche to serve with it. I live in Seattle, Washington and we have stared our “rainy” season with some pretty heavy storms, so soup and bread for supper is perfect. Thanks again!